Free Practice 1 had seen several upgrades and experimental parts from teams such as Movistar Yamaha MotoGP and the Repsol Honda Team. In Free Practice 2 yet more new parts were introduced as the MotoGP™ World Championship embraced winglets, at least one bike from each manufacturer running winglets in the second session. 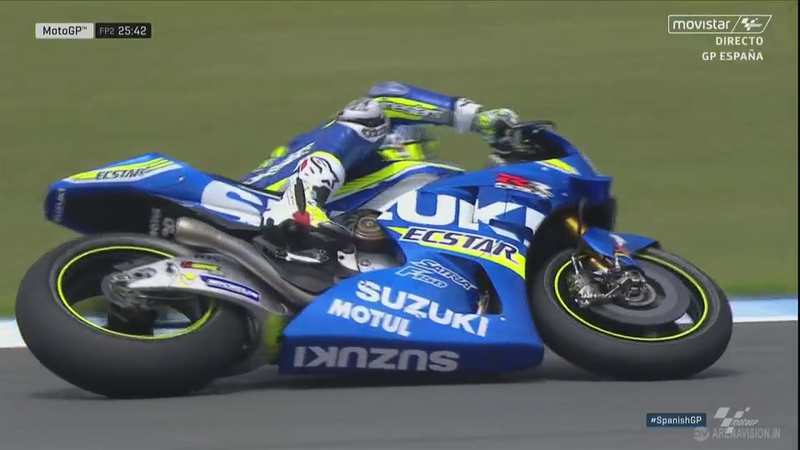 Aleix Espargaro’s (Team Suzuki Ecstar) GSX-RR had a total of six winglets with three small ones down each side of the front fairing, Suzuki had planned to test them on Monday but Espargaro pushed to use them before. 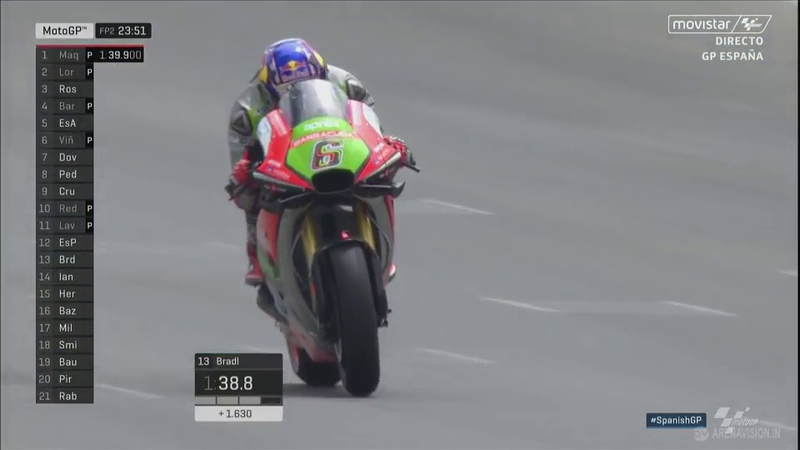 Stefan Bradl’s (Aprilia Racing Team Gresini) RS-GP also had winglets fitted, looking very similar to the ones used by Yamaha and Ducati just under the front fairing. Winglets are used by most teams to help reduce wheelie out of corners. In previous years wheelie was tamed by electronics, but with the new Magneti Marelli system a more robust solution was needed. Therefore a more physical answer has been found with winglets. No two winglets are alike and each manufacturer is taking a slightly different approach to size and positioning. Having stolen headlines in the build up to the weekend, Jorge Lorenzo (Movistar Yamaha MotoGP) again grabbed all the attention as he topped both Friday practices. A 1’39.555 saw him end the opening day as one of just two riders able to drop below the 1’40 barrier. Lorenzo had also led Free Practice 1 but was able to improve his time by 0.7s in the second session to end 0.345s ahead of Marc Marquez (Repsol Honda Team). This weekend is all about Lorenzo looking for victory to try and close the 21-point gap to Marquez in the championship standings. Marc Marquez, with winglets fitted, slid his way around the Jerez circuit in 1’39.900 to set the first sub 1’40 lap of the 2016 Gran Premio Red Bull de España. He would be bested by Lorenzo, the only other rider in the 1’39s, ending the day 0.345s back on the Majorcan. Although he was behind Lorenzo, Marquez’s improvement between the session was even more impressive as he dropped almost a full second off his time. With the lead in the championship, Marquez can afford to settle for the podium this weekend. A late flying lap from Aleix Espargaro made it three different manufacturers inside the top three. The elder Espargaro brother is continuing to ride on a wave of confidence after his return to the top five in America. On paper the layout of the Jerez circuit should suit the Suzuki GSX-RR more than any of the previous circuits and Epsargaro’s early pace is certainly proving the prediction true. Like Marquez, Espargaro made major steps forward with his one lap pace in the second session as he improved his best time by 0.9s. His fastest time was set on a GSX-RR without winglets. Once more it was Hector Barbera (Avintia Racing) who was the leading Ducati rider as he nestled into fourth, 0.674s from the top. The return to Europe has brought with it a change at the top, a number of new riders such as Barbera able to mix amongst the established order. Barbera continues to prove that there is life in the GP14.2, despite it being several seasons old. Valentino Rossi (Movistar Yamaha MotoGP) completed the top five, once again working tirelessly throughout the session as he again completed 20 laps. 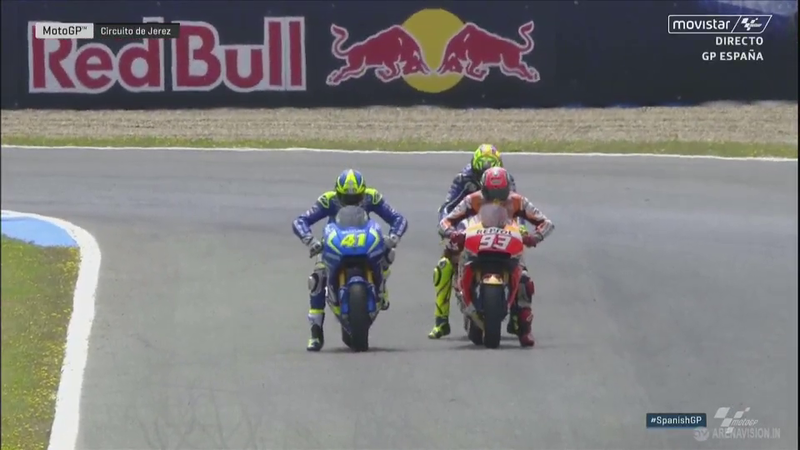 0.727s separated Rossi from his teammate at the top of the timesheets, while the gap may be significant; the Italian has always been a rider able to improve come race day and is currently un-phased. 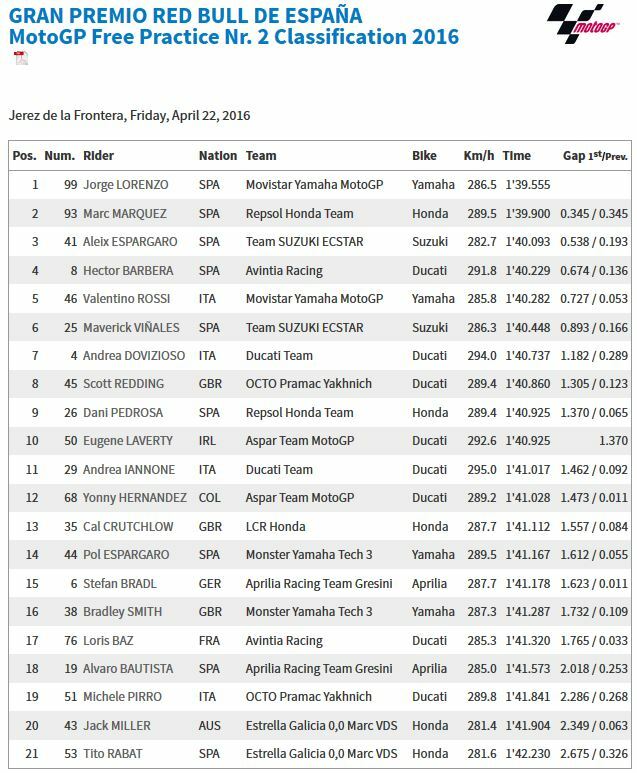 Maverick Viñales (Team Suzuki Ecstar), Andrea Dovizioso (Ducati Team), Dani Pedrosa (Repsol Honda Team), Scott Redding (Octo Pramac Yakhnich) and Eugene Laverty (Aspar Team MotoGP) rounded out the top ten. 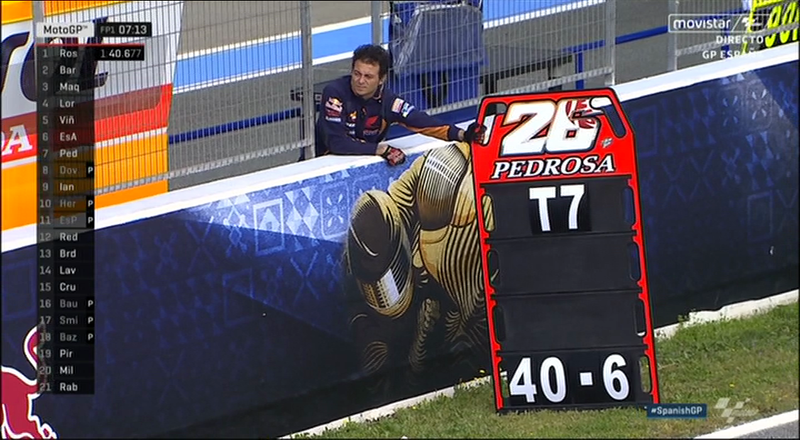 Pedrosa was the only rider unable to improve his time in FP2, 0.102s slower in the second session. A number of big names were absent from the top ten on combined times and will have significant work to do on Saturday or risk having to fight through Q1. Andrea Iannone (Ducati Team) struggled in both practice sessions, ending the day in 11th overall. Ducati revealed that their data from the test in November was of little use due to the changes to the Michelin tyres since then, causing Iannone to start almost from zero in Jerez. Both the Monster Yamaha Tech 3 riders also had a difficult start to the Spanish GP, Pol Espargaro ending 14th with Bradley Smith a distant 16th and neither rider within a second and a half of Lorenzo’s time. Smith has been struggling for several rounds now and is eagerly awaiting the test on Monday to get some much needed track time to solve his issues. Meanwhile, Espargaro’s troubles have seemingly come out of the blue as the Spaniard had been strong in all three previous rounds. He’ll need to work hard overnight with his team or risk losing fourth place in the World Championship.